Please join us for an opportunity to meet the team! Talk with the Executive Director, Denise Henry, the Director of Enrichment Services, George Reid-Perry, and other members of our management team. 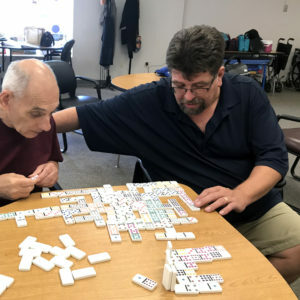 Our SARAH In Action Madison location offers unique Day Programs designed to keep the people we serve active and engaged. Our friends in Madison enjoy hosting a Sitercize class on Thursdays, when this exercise class is in session they welcome friends from the Westbrook and North Haven locations to join the fun. Individuals in Madison also participate in volunteer activities like the Madison Meals on Wheels program. Other activities at the YMCA in Branford and at a local pony farm have piqued the interest of our Enrichment Program attendees – Madison Program Manager, Barry Smith, is seeking to develop an Equine Therapy Group and an Art Therapy Group to keep up the momentum. Jen Kostek, Director of Employment Services, and members of her Employment team will also be on hand to discuss positive changes to our Employment Services, including Individual Supported Employment and Transitional Services. With the support and guidance of Jen’s team, more people than ever before are successfully finding competitive employment! They are actively looking for more business partners and just initiated SARAH Inc.’s first internship program with a business in Guilford! If you have any questions about this Open House or want to talk to someone at SARAH Inc., then please email marketing@sarah-inc.org! We look forward to seeing you soon! Henry Leads Proactive, Person-Centric SARAH, Inc.